Arriving home slightly earlier than the last two days I thought I could work on a post about Islay and distilling I've had in my head for a few days now. That plan was swiftly changed when I opened my e-mail and there was a very interesting mail from Islay waiting for me. The stills have to wait for another day or two or three, some concrete is more important. 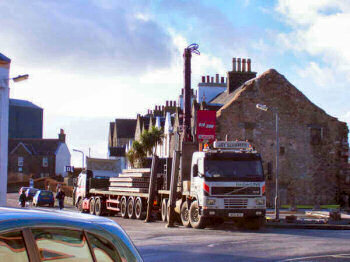 Not just any concrete, no, the floor for the new hotel in Port Ellen has arrived. 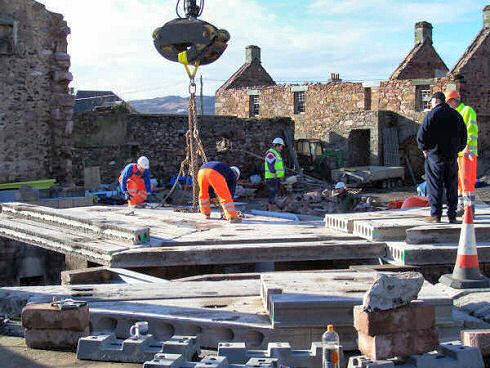 As far as I understand the floor sections are precast and transported to Islay by lorry. 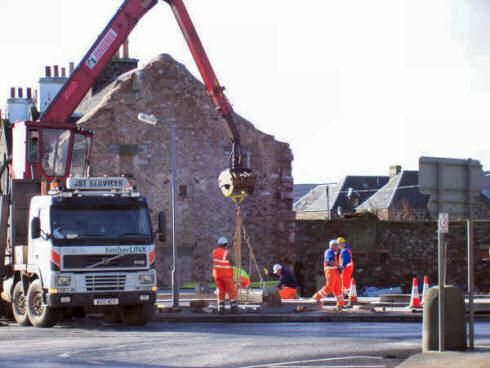 They were then put into place using a crane on one of the lorries. The whole process took the best part of the day today. Looking the other direction you can see quite a lot of the north-western wing floor already completed. Note the dog watching the proceedings! It's really nice to see all this progress, combined with the nice weather today. Spring and more good building progress can't be far away now.